MIRIAM COOK WALL AND NEWSOM SUMMERLIN, JR. 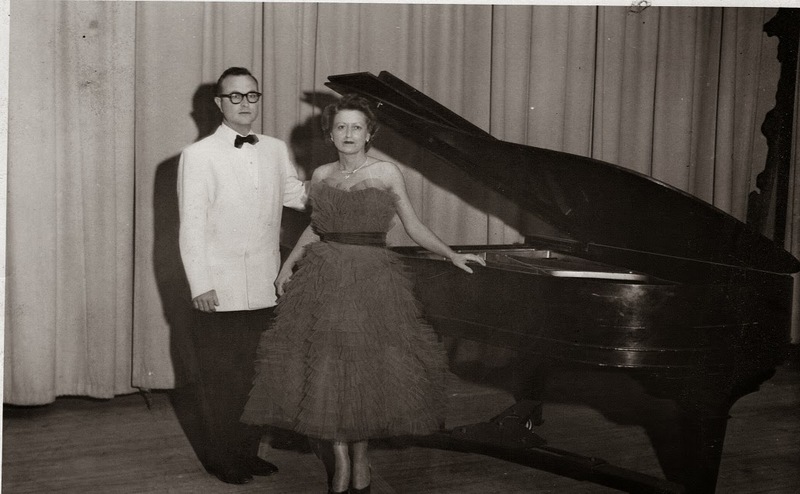 In the spring of 1955, I think it was April, my mother and Newsom Summerlin, Jr. presented a duo-piano recital at the Auditorium of Sandersville High School. They played Buxtehude, Rachmaninov and Gershwin - and Mama changed dresses for each section of the concert! The dress in this picture was by Ceil Chapman. For the Rhapsody in Blue she wore a floor-length chiffon dress which her friends studded with hundreds of blue sequins. Could it be more 50's? I ask you? Regretfully, there are no recordings of either of them playing. Newsom had studied piano with Mama when he was a teenager. They are both gone now. I wonder if they're concertizing in heaven. There's some good music going on if they are! You did not get any of your fashion sense from your mom. Pity. She was most stylish.